The Theatre’s president, Margaret Kinley, Commissioned local sculptor, Andy Shaw, who created a striking sculpture of three figures, designed to convey something of the spirit of theatre in performance. The figures are clearly contemporary, but they stand on corbels copied from the classical architecture at the front of the building. Surrounding the sculpture are the names of a representative selection of dramatists, all of whose works have been staged at WLT. We all want to thank Margaret for her fabulous gift which will be cherished by us all. Our wonderful sculpture is a tribute to everyone entering our magic threshold, past, present and future. 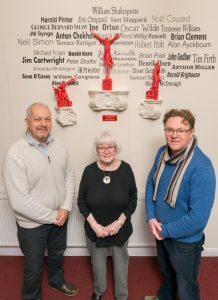 ‘The Play’s the Thing’, pictured with the Theatre’s president, Margaret Kinley, Commissioned local sculptor, Andy Shaw, and WLT Chairman Paul Dawson.